Being a pale skinned gal, finding a vegan foundation that is light enough for me has always been a bit of a challenge, even most tinted moisturisers that tend to be quite fair are usually too orange on my skin. 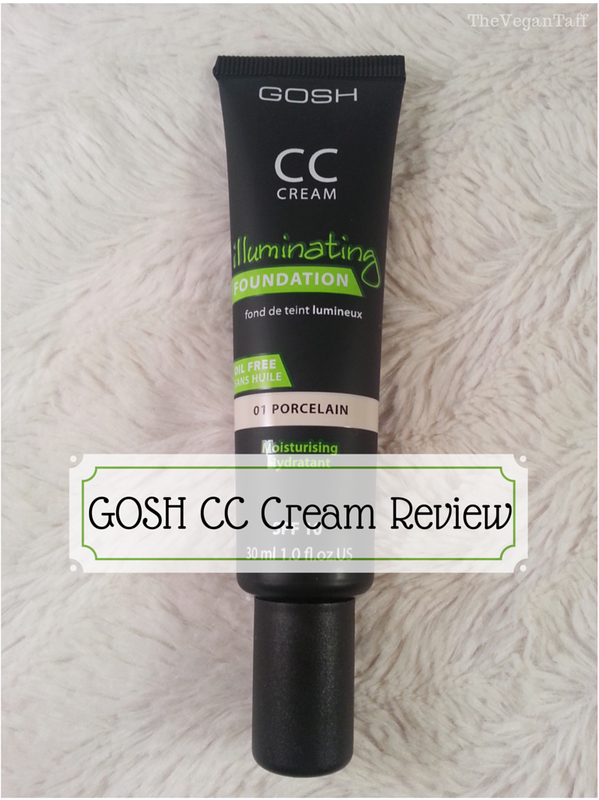 I really don't know what made me buy the GOSH CC Cream, especially as it was online and I had no idea how light Porcelain really would be, but I figured that if it was too dark for me I could give it to my mum and it'd probably work for her. ... an illumination foundation that offers five results in one easy step. CC Cream illuminates skin, gives a light coverage and evens out skin tone. Adds moisture to the skin and SPF 10 protects against the sun. Thanks to light-reflecting pigments skin imperfections will appear less visible. The active ingredient Gatuline® Radiance keeps skin looking flawless with its anti aging properties that improve skin microcirculation. The formula is oil-free. - Helps skin to stay moisture. - Protects against the sun with SPF 10. - Perfume and parabene free. The shade 'Porcelain' is a fantastic match for me, I know most bloggers compare their foundations to MAC, but they test on animals so I can't give you that comparison I'm afraid. If it helps, I'm between a Linen and Oyster in Sleek's foundations. To help with the shade, I've photographed the GOSH CC Cream on white, you can tell here how pale it really is. I have combination skin with occasional dry patches and I find that this CC Cream works brilliantly on it, it doesn't cling to the dry areas and even if I get oily in my T-zone it still sits beautifully. The wear time is also great, it lasts a good 10 hours or more without fading in the slightest, but recently as the weather has been so warm I've started using ELF's Mist and Set and I find that with this extra help it still looks great at least 12 hours after application (until I take it off, however long that may be). I'd also say that if you don't like a dewy looking foundation that you will need to powder, but if you don't mind it you certainly don't need to powder to make this last. The CC Cream is packaged in a black tube with a screw off lid, there is no pump so you only need to squeeze out as much product as you need, meaning no waste. It's quite thin in consistency but applies really well with a foundation brush, I find the best application method is using my Real Techniques Buffing Brush. 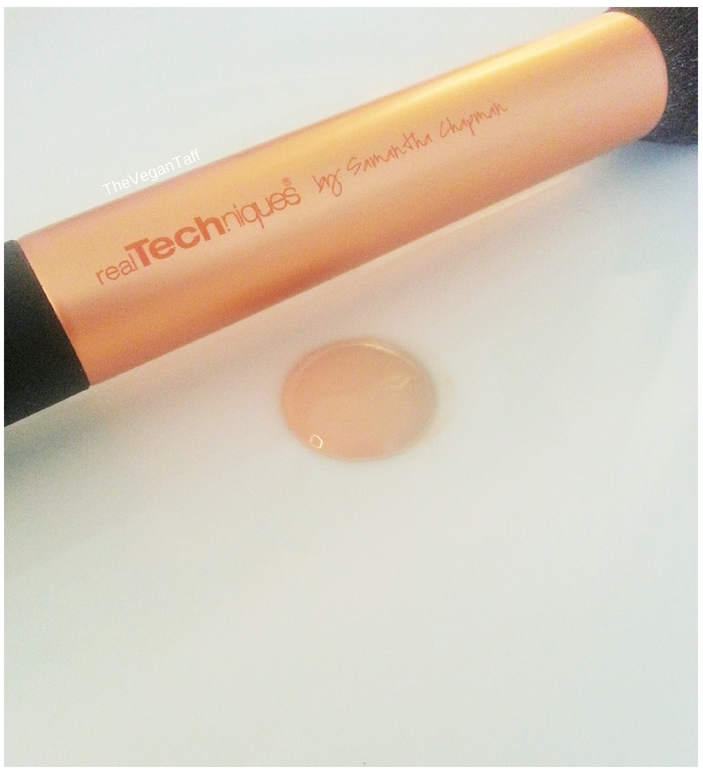 To get a natural finish I use the amount shown in the above photo, but it is buildable if you want a heavier coverage. Over all I absolutely love the GOSH CC Cream in Porcelain; it's not sticky, looks natural, is buildable, has no distinct scent, doesn't break me out and feels moisturising. If I had limited time to do my make-up this is the thing I would reach for first and already have another tube on order for when this one runs out. Have you tried this or anything else from GOSH? Or maybe you're pale like me and find it hard to find a foundation fair enough, I'd love to hear what you use.